This month the emergency department point of care ultrasound in out-of-hospital and in-ED cardiac arrest trial from the REASON1 trial is published in the journal Resuscitation. 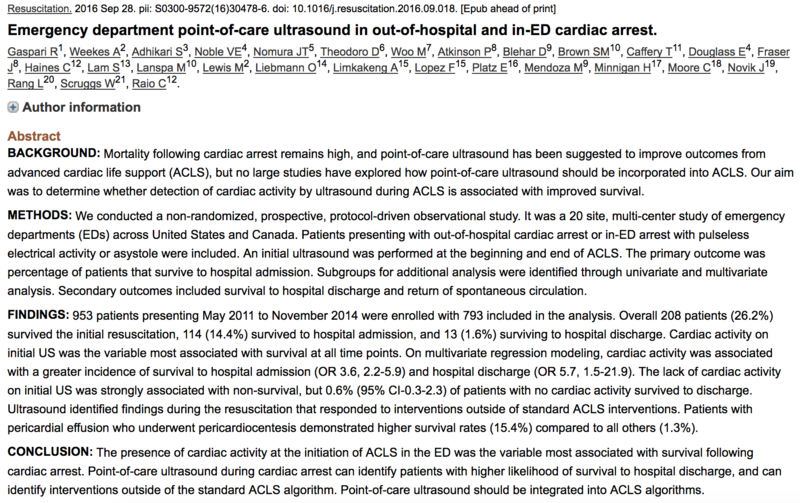 This has been rumoured for some time in the #FOAMed world as patient outcome related evidence for the use of ultrasound in cardiac arrest is not yet definitive. So, the REASON1 trial is a protocol driven observational trial of the use of point of care ultrasound in the management of cardiac arrest patients in the ED. The aim is stated as looking at the association between cardiac activity on ultrasound and outcome. As always you should read the abstract below, and of course we always recommend that you read the full paper. What type of study is this? This is described as a protocol driven observational study. In essence, they have decided to introduce USS into the management of cardiac arrest patients. Is that the best design? That rather depends. If the aim is simply to look at the association of cardiac activity on survival then that would seem to be OK. However, the use of USS is in itself an intervention in that it can guide therapy (more on this later), so it’s not entirely observational. It’s not as if we can just look at the USS and ignore it, we do (and they did) act on the findings and thus we could argue that this is really a trial of an intervention. If so then this is not a great design. A randomised controlled trial would be a better design if we want to know if USS makes a difference to outcome. Tell me about what they did. OK. They took patients with out-of-hospital cardiac arrest (OOHCA) or cardiac arrest in the ED who were in PEA or asystole (so not the VF/VT patients). Patients had a point of care USS at the beginning and end of ACLS processes. 793 patients were included in the analysis. Those with DNR orders or with early stopping of ACLS were excluded, though interestingly this was after USS which may have influenced outcome. Thus USS is operating as an intervention even at an inclusion stage for this study. The main outcome was survival to discharge, though they also looked at ROSC and admission to hospital rates. They performed some reasonably complex but fair statistical analysis to determine if cardiac activity on USS predicted outcome. Importantly the main findings of ROSC, admission, and survival to hospital discharge are associated with the finding of cardiac activity on that initial ultrasound. This is arguably unsurprising as a heart which is moving intuitively feels easier to resuscitate than one that is at standstill. Patients with cardiac activity on the initial USS survived to hospital discharge on 3.8% of occasions vs 0.6% where it was absent. For ROSC the difference is even greater – 51% vs 14.3%. So the association appears to be there, and with statistical analysis using a multivariate model, cardiac activity was the single most important factor in survival, although factors such as downtime, rhythm and location of arrest were similarly important. What else did they find? Interestingly, or should I say unsurprisingly, the USS revealed more than just cardiac activity. POCUS ECHO revealed pathologies such as cardiac tamponade or possible pulmonary embolus and this resulted in clinicians starting specific therapies such as cardiac pericardiocentesis or thrombolysis. Again this means that ECHO was being used as an intervention and not just an observation which confuses the design in my opinion. For example this resulted in 13 pericardiocentesis attempts and a much higher positive outcome in this group. Remember that these were not the main aims of the study and we should be cautious as a result. They also found that amongst the asystole patients 10% had cardiac activity. Not something that you would expect and perhaps a caution for relying on the monitor alone. So what does this mean for us in Virchester? It’s tricky. First up, we are big fans of ECHO in cardiac arrest, although the evidence is less than conclusive2–5. We believe it helps and so it’s easy to take a study like this as confirmation of our prior beliefs and bias, but let’s be careful. Although mooted as an observational trial the lack of blinding means that it resulted in USS becoming an intervention and guiding therapy. Such trials are prone to bias and an RCT would provide a better standard of evidence. It is possible that false positives, iatrogenic harm or early abandonment may have influenced the outcomes of this study. Arguably they could have blinded the treating team to the USS findings, but the ethics of this if they saw something treatable would be complex. Despite this, the differences in rates of ROSC, admission and survival between those patients with and without cardiac activity are significant and are probably true. The authors also point out that they were unable to look at longer term outcomes which are important in cardiac arrest research. More work on neurological outcomes would be welcome. We should also note that the lack of cardiac activity was not a perfect predictor of non survival. Three patients survived despite no initial cardiac activity; USS is therefore a decision aid and not a determinant of outcome. A lack of cardiac activity on initial USS is very probably associated with a worse prognosis. The role of USS in improving outcome as an intervention in cardiac arrest is less certain6. In Virchester we will continue to use POCUS ECHO in cardiac arrest to guide therapy and to prognosticate until further evidence is available though we recognise that at least some of this is based on faith7. How to cite a St.Emlyn‘s blog post in your next assignment or paper. State of the Evidence Cardiac Arrest Echo. REASON trial with Romolo Gaspari. #FOAMED. ultrasoundpodcast.com. http://www.ultrasoundpodcast.com/2016/01/state-of-the-evidence-cardiac-arrest-echo-reason-trial-with-romolo-gaspari-foamed/. Published 2016. Accessed October 9, 2016. EM Nerd-The Case of the Tell-Tale Heart. emcrit.org. 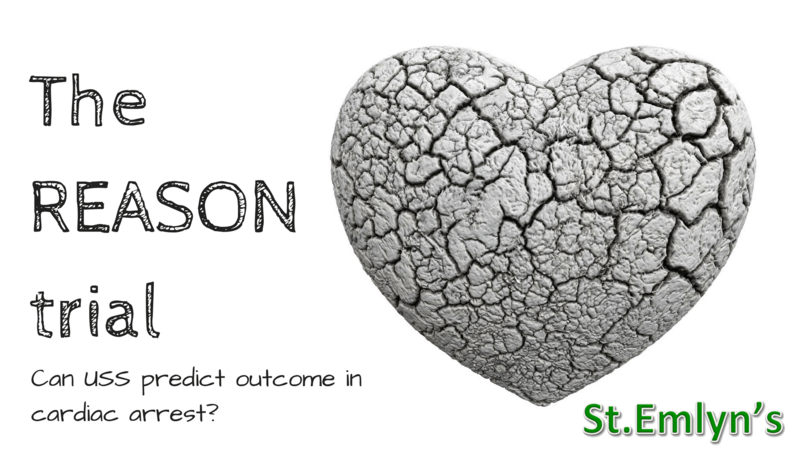 http://emcrit.org/emnerd/the-case-of-the-tell-tale-heart/. Published 2016. Accessed October 9, 2016. What to believe and when to change. stemlynsblog.org. http://www.stemlynsblog.org/believe-change-st-emlyns-smacc/. Published June 2014. Accessed October 9, 2016. Previous: Previous post: Paediatric Trauma Snapshot: What’s New? Next: Next post: All the King’s Horses… difficult conversations with children in critical care. St.Emlyn’s. This is an observational study as stated by the authors, not a trial. It is important not to call it a trial because a trial is an evaluation of an intervention to improve outcome which is not the case here. Whether the study was purely observational, and the implications on its conclusions, is a matter for discussion but the stated study design is not.